Cyprus is one of those places I have been itching to go to for many many years. I still haven’t made it. One of my friends was at art college there and raved about the wonders of the Island. It’s known for its good climate, soil fertility and mouth watering food. High quality wheat, olives, almonds, grapes, lemons and potatoes are all grown there along with an abundance of other vegetables and fruit – sounds like my kind of place. 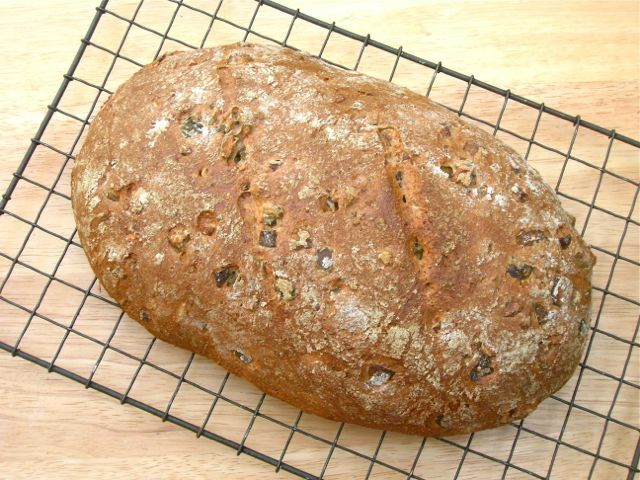 Olive bread, called eliopsomi, is common fare. It may also contain fresh or dried herbs, onions, lemon zest, cheese or, as in my case, garlic. I took inspiration for the recipe from The Olive and the Caper: adventures in Greek Cooking by Susanna Hoffman. I found the recipe for olive garlic bread all over the internet, but sadly, rarely accredited to the author. As well as adapting the recipe to make it suitable for metric measurements, I decided to use wholemeal spelt as the main flour. I’ve said it before and I’ll no doubt say it again, spelt not only adds additional fibre and a nutty flavour, but is easier on the digestion than modern wheat flours. Halloumi originates from Cyprus, so I felt I couldn’t really do a recipe that didn’t contain that much loved vegetarian cheese. Halloumi sandwiches are very common there and although they sound absolutely my kind of food, I wanted the bread to accompany another Cypriot dish, turlu, a spiced vegetable stew. With this in mind I decided to add Cypriot halloumi to the bread so we’d be getting some protein in our meal. Of course for a dairy free or vegan version, this can be left out. Both the bread and stew were delicious and worked brilliantly together to create a very satisfying meal. The bread turned out perfectly, with a good chewy texture and a rich flavour. The next day, I had it toasted for lunch, simply spread with butter – it didn’t need anything else. The day after that, I did exactly the same. No matter that the rain was lashing and the wind was howling, I felt I’d captured a little piece of Cyprus. Now, where’s my plane ticket? A beautifully textured bread with a full on olive and garlic flavour with added depth from the halloumi. Great for mopping up sauce from the plate and delicious toasted. Whisk the sugar and yeast into the water, making sure it's warm, but not hot. Cover and leave for ten minutes. If kneading by hand, place flours and salt into a large bowl, make a well in the centre and gradually add the yeast mixture together with the olive oil, stirring as you go until the mixture comes together to form a dough. Knead for a good ten minutes, adding the olives, garlic and cheese in near the end. Otherwise, throw everything into the bowl of an electric mixer and using the dough hook knead on a low setting for ten minutes. Place dough into a floured proving basket or bowl. Cover and leave to rise until nearly doubled in size. Turn out of the basket onto a baking tray and slash the top with a sharp knife two or three times. Bake at 220℃ for 10 minutes, then turn the oven down to 200℃ and bake for another 25 minutes or until the bread looks baked and the bottom of the loaf sounds hollow when tapped. Disclosure. I was sent some ingredients and a shopping voucher in order to develop this recipe. This sounds absolutely delicious! Olives, garlic & halloumi – it’s never going to be bad, is it?! Well it’s pretty much olive bread Emily. The garlic and/or cheese could easily be left out, but I rather like it as it is. Delicious recipe, interesting fact about Halloumi , it’s a protected Cypriot product in U.S but you get it in almost all middle eastern stores. Absolutely love Halloumi and will give it a try! Thanks Prateek. I think it might be here too as all the packets have Cyprus mentioned on them. I love this idea and love homemade breads. It’s the perfect time of the year to try this one with a nice vegetable stew. I’d totally love this with a stew or some soup – it’s definitely that time of year now isn’t it! I haven’t been to Cyprus yet, either… maybe one day. Love your bread… spelt flour seems quite $$$ here. You may not have made it to Cyprus Liz, but you did get to see some fabulous places this year. Spelt is pricy here too. It can be hard finding a balance between buying healthful foods and one’s purse. Never heard of this before, sounds a very tasty bread indeed. Thanks Stuart. It really was and it made fantastic toast too. 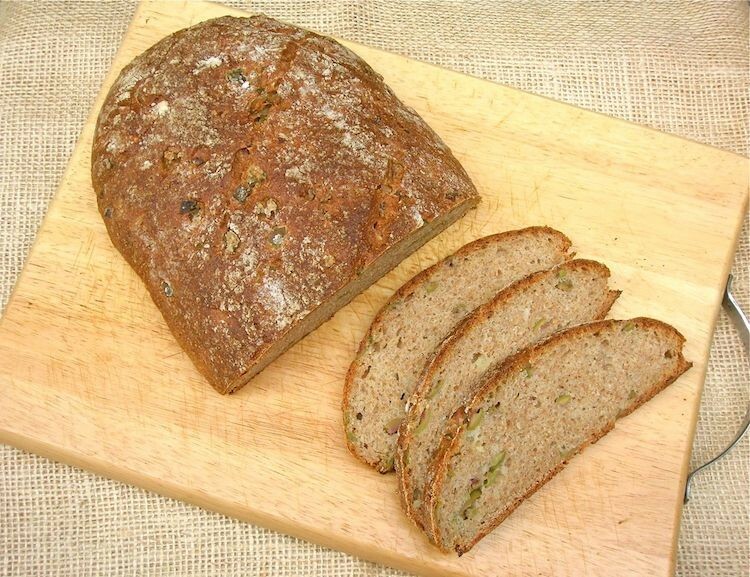 what an absolutely brilliant combination of flavours in this beautiful bread! I’ve never been to cyprus before but I too would love to go… all that east meets west flavour… divine! You put a lot of the flavours that I like into this bread. I would love it. It’s a bread to love Bintu and I was somewhat regretful when we finished off the last few slices the other day. I have never baked with spelt, maybe it’s time I did as your bread looks so lovely and has inspired me. Definitely worth trying Nayna. Spelt is my favourite flour – it tastes good and is more nutritious too. Looks so delicious.. I haven’t tried anything with spelt flour.. wondering If I would find it here in the stores. Thanks Shobha. Spelt is a wonderful flour. If you can’t find it in your local supermarket, you could try health food shops. Nothing beats a good loaf of bread — especially in the mornings. This bread sounds so ‘exotic’, at least from where I’m from! Gotta give this one a try! Thanks for sharing! The Bread looks delish. Thanks for sharing. Thanks Preethi, it really is delicious and I wish we still had some left. Oh wow, I would never have thought to add halloumi to the bread itself! I have to give this a go – I am totally in love with all things olive and halloumi and I absolutely love using spelt flour – so this is right up my alley! I have never much experimented with flavours of breads, which is silly since I love to eat them! This one looks really unusual and I’d love to try it!